Just over two hours flight from the UK, the Costa del Sol is the popular short-haul option with more than 300 days of sunshine a year and everything you could want for in a holiday. Nowhere else on earth can you find beaches, history, culture, sports, fantastic cities, the great outdoors and even skiing, all in one compact destination! Kathryn Stride gives her run-down of some of the fantastic activities to try in the Costa del Sol for your next holiday. We all associate the Costa del Sol with the sparkling Mediterranean Sea lapping against fantastic sandy beaches, and it’s certainly a great place to soak up the sun, immerse yourself in the relaxed atmosphere, and enjoy the world-renowned nightlife. However, what many people don’t know is that Andalucía as a region also offers Europe’s Southern-most ski resort, with great skiing from December to the beginning of May. This winter wonderland is just a stone’s throw from the Costa del Sol and on a good day you can even see the sea from the slopes. In fact it’s so close that you could combine skiing with a day on the beach to recover before you head home. It’s even possible to be on the slopes in the morning and then within two hours drive be enjoying a long afternoon of warm sunshine on the coast. The Sierra Nevada (Snowy Mountain Range) near Granada offers plenty of sunshine, good snow and a varied mix of runs for beginners and intermediates, plus a handful of more challenging runs. Although it is not a huge resort, there are wide, well-pisted slopes, quick and efficient lifts, and good restaurants and bars to rest those weary feet. The après-ski is quite legendary too! This area of Spain has been slammed for its concrete tower blocks and non-existent town planning. However, don’t be fooled by this negative press coverage. For every Torremolinos there are several stunning white villages nestled into the hillsides, not to mention vibrant, Spanish towns and cities with great architecture. Marbella is a fantastic town with lots of charm, a predominantly Spanish population, a beautiful beachside promenade and tons of bars and restaurants. It is often confused with the nearby Puerto Banus and thought to be an expensive, flashy place, but in fact this is a very real, working Spanish town and merits a visit. Marbella’s hidden gem is its historic and picturesque Old Town, or casco antiguo. This has changed little over the centuries and still features ancient architecture, a maze of narrow cobbled streets with charming white washed houses, and beautiful plazas adorned with fountains. At the centre is Orange Square, a beautiful Andalucian square, full of orange trees and sweetly scented tropical plants. The Old Town is full of unusual shops and galleries, little chapels and churches, not to mention a fantastic selection of bars, cafés and eateries, and is a great place to explore. The picturesque Pueblos Blancos white villages are a typically Andalucian feature and have been well-preserved, yet little explored by most tourists. If you are able to hire a car then you can spend several days driving around the stunning countryside, exploring these little villages and stepping back into Andalucia’s past. One of the most breathtaking places to visit is the mountaintop city of Ronda, located less than an hour’s drive from the coast. 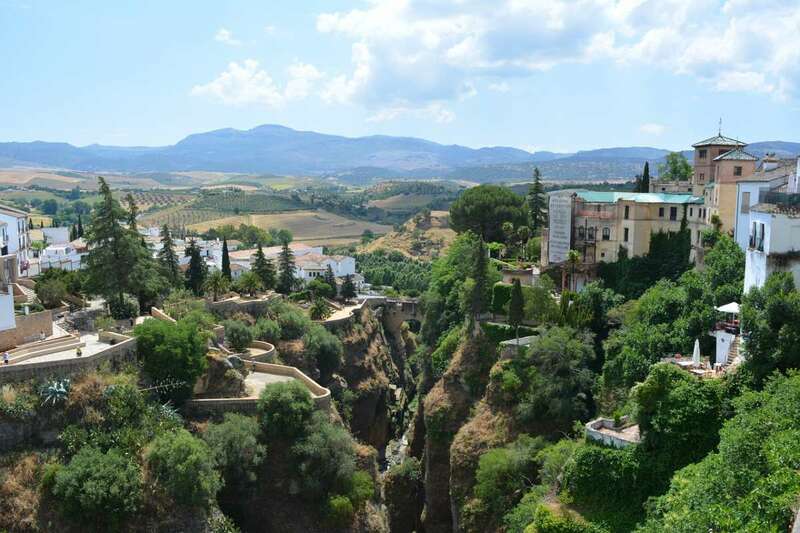 This city is set above a gorge (El Tajo) giving dramatic views and the stone bridge that spans the gorge offers the perfect place to take in the stunning scenery. The old town dates back to Moorish rule and is full of history and charm. Closer to coast and more popular with tourists is the beautiful village of Mijas Pueblo. Located just a 20 minute drive inland, this village has remained relatively unspoilt by tourism maintaining its Spanish charm and offers spectacular panoramic views of the coast from its many view points. Wander the cobbled streets and sample the local delicacies, there are also many specialist shops around the town including handmade leather and ceramics. Every Wednesday the town hall puts on a popular flamenco show at midday in the main square. For golfers, it features more than 70 fabulous golf courses, which has earned the Costa del Sol its nickname of Costa del Golf. With year round sunshine this is a golfer’s paradise. The coast is host to some high-profile big prize tournaments such as the Volvo Matchplay. If you like tennis, there are many fantastic tennis clubs, as well as many outdoor courts attached to hotels and urbanisations. Many international tournaments are hosted in the Marbella area. The region is a perfect place for mountain-biking and hiking in the nearby hills and mountains. For the more adventurous a hike up the iconic La Concha is a must, but as it is as high as Ben Nevis it isn’t to be underestimated. There are numerous companies offering quad-biking, horse-riding and walking tours to help you make the most of the stunning scenery just minutes from the coastal resorts. There are also a host of water sports to take advantage of the warm Mediterranean Sea, such as sea-kayaking, windsurfing, scuba diving, kite surfing or even learning to sail. Or if you want something potentially less wet, you can take to the sea for a spot of fishing, or enjoy a catamaran cruise to try and spot some of the native dolphins. Andalucía boasts some of the most amazing architecture and the most breathtaking sights to be seen anywhere in the world. There’s the narrow, bustling cobbled streets and ancient architecture of the Jewish Quarter in Seville; the harmonious blend of two thousand years of Christian and Muslim religious history in the stunning Mezquita in Cordoba; the world-famous Alhambra set against the snow-covered peaks of Sierra Nevada in Granada, and the golden dome of Cádiz cathedral shimmering high over the white-tipped waves of the blue Atlantic ocean. These cities’ treasures are no more than two or three hours away by car from the Costa del Sol and make fantastic day trips to spice up any Costa del Sol holiday itinerary. Spain’s capital, Madrid, is also within easy reach of the Coast now, with a two hour journey by high-speed train bringing all of the city’s immense heritage right to your door. Even closer to the coast is the lovely and often overlooked city of Malaga. Malaga is so much more than an airport. Its long history has left a host of beautiful monuments such as the Cathedral, Gibralfaro Castle, the Alcazaba and the Roman Theatre. There are also a selection of beautiful historical gardens, and over 20 different museums to choose from. However, it’s the city’s artistic heritage that is its biggest claim to fame. Malaga was Picasso’s birthplace, and has the fantastic Picasso Museum to honour and celebrate the city’s most famous son. This gallery has over 200 examples of works by Picasso on permanent display, including oil paintings, sculptures, drawings, sketches, etchings and ceramics housed in a stunning 17th century Renaissance building. A holiday in Spain is a great way to get rid of the stress and strain of working life. Visit some of the beautiful beach clubs, stroll down the promenade and enjoy the laid-back pace of life. In addition, there are some amazing luxury spas and health clubs where you can pamper yourself and ensure you come back rested, relaxed and rejuvenated. If facials and treatments just aren’t enough to achieve the desired result then you can combine a relaxing holiday with a spot of cosmetic surgery, for a truly rejuvenating trip! There are several world-renowned clinics to choose from in this area, and it can often be a more affordable and discreet option than the UK. All clinics have fully-qualified, English-speaking surgeons, excellent after-care and an opportunity to recover gently from the surgery before returning home. Spain is a very family-friendly place and kids are welcomed wherever you go. The Costa del Sol has a whole host of fun places to go and things to do, ranging from days spent on the beach, swimming and playing ball games, to great amusement parks like Tivoli World in Benalmadena and the Parque Acuático Mijas water park in Mijas-Costa. Families can also enjoy a number of other high activity attractions in the area including Funny Beach, near Marbella, with its go-karting track, trampolines, electric bikes and cars, and children’s rides as well as Aventura Amazonia, a tree top high ropes course just a 10 minute drive from Marbella. For animal lovers there’s the Bioparc Zoo (Fuengirola), SeaLife centre (Benalmadena), Butterfly Farm (Benalmadena), Crocodile Park (Torremolinos), and the Selwo safari park in Estepona. The cinema in the Fuengirola’s Miramar centre shows English films and other activities include a large crazy golf park with bbq restaurant (Fuengirola) and Costa Jump, a huge indoor trampoline park. For more teenage fun, there are many good organisations on the coast who offer such adventures as scuba diving, quad-biking, jeep safaris in the National Parks, mountain treks on horse-back, canyoning in the region’s gorges, and paintballing. As well as Segway tours to explore some of the major towns and cities. One of the many pleasures of a visit to the Costa del Sol is the fantastic food. There are so many great restaurants to choose from, serving all types of food. The chiringuitos on the beach are great and tasty tapas is an excellent way to sample some of the local Spanish fare. You don’t have to walk far to find a good restaurant, the main problem is knowing which one to choose.